Picture it: you find out your company offers you the chance to earn your next degree. The catch? 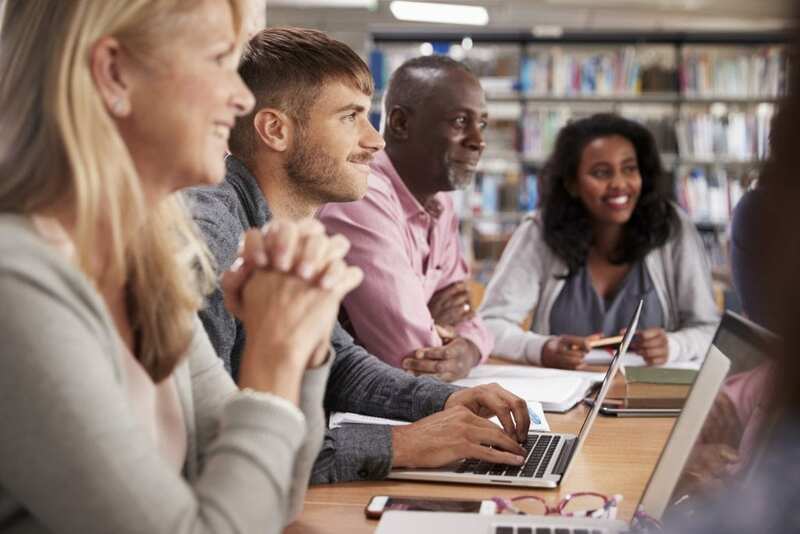 You’ll be part of a “cohort,” a group of students made up of other people who work within your organization, working together through the same courses. You hesitate. Maybe you’ve been out of the classroom setting for a while, or you’re apprehensive about group projects with people you don’t know well, or at all. These are normal concerns we hear from working professionals who are about to join a corporate cohort. Luckily, there are some long-lasting benefits to learning alongside your coworkers. Learning in a cohort is an opportunity to meet and network with coworkers you wouldn’t have necessarily met otherwise. People from different departments, divisions, and even geographic locations will get to know one another by working together on projects and other class activities. Friendships created through class might lead to increased project opportunities and career advancement. Through this collaboration, and applying what you learn to workday projects, you also gain a greater understanding of your organization as a whole. This knowledge of the people and workings of your company makes you an even better candidate for promotions in the future. WPI is sure to execute Non-Disclosure Agreements with our corporate clients, which allow their employees to speak freely in the classroom about the sensitive or proprietary projects upon which they work. This enables students to apply the educational tools they learn directly to the challenges or scenarios they face in their everyday responsibilities and see an immediate return on the investment of graduate education. Because of this specialized perspective and the chance to put their coursework into practice right away, many students report a greater sense of fulfillment from class when learning in a corporate cohort. Learning in a cohort ensures that you are surrounded by like-minded individuals experiencing the same questions and concerns as you. Peers within a company begin the program together and work toward the same goal, at the same pace, with one another. Your cohort classmates are there to encourage and guide you through your learning experience, and vice versa, which means you won’t ever feel unsupported. These are just a few reasons why a corporate cohort can be a positive experience. There are many more out there, and even more reasons to get a graduate education. It’s never too late to advance your professional development and strengthen your indispensability at your company. Don’t let some pre-program jitters hold you back! Learn more about programs WPI can bring to your company. « Digital System Design – Crash the Course!